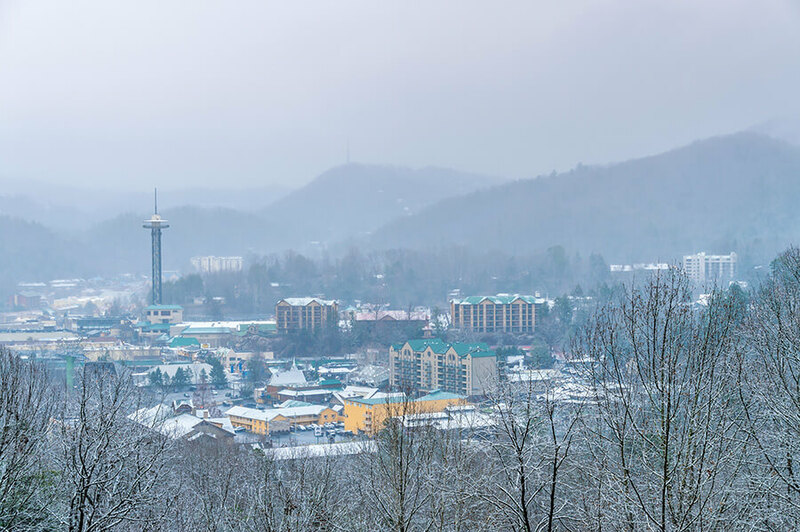 The holidays in Pigeon Forge, Gatlinburg, and Sevierville start in November! This year you can expect bigger and better light displays, Christmas shows, decorations, and festivities that will bring warmth and excitement to your heart. On November 23, 2017, the Titanic Museum will be more than just the legendary ocean liner. Their annual event starts at 7 p.m. with music and a live outdoor fireworks display. Caitlin Mesiano is the featured performer this year. After the event, visitors can purchase tickets for a yuletide celebration inside the Titanic Museum. More than five million lights dress Pigeon Forge during Winterfest. Their 28th annual kickoff begins on November 7, 2017, at 4 p.m. with games and vendors displaying their wares. Entertainment by several performers begins at 6 p.m., and the free Trolley Tour of Lights (beginning at Patriot Park) starts at 7 p.m. The winter displays can be seen through the end of February. The start to the stunning Gatlinburg light display is quite spicy. There is an annual chili cookoff that kicks off Winterfest, and this year the Kickoff is held on November 8, 2017, from 5–8 p.m. Traffic light #6 is where you’ll find entertainers, including headliner, Tara Thompson, at the Bush’s Best Stage. At 6 p.m., this is also where the Winter Magic Kickoff lightning will be held. Chili sampling tickets can be purchased for $10, but the rest of the event is free to attend. The Winter Magic Trolley allows visitors to check out all the displays for $5 a ride from November 8 through January 27, 2018. This annual event is held on November 22, 2017, from 10am until 7pm and continues through Sunday, November 26, from 10am until 5pm. There will be children’s crafts and play area, entertainment, beautifully decorated Christmas trees to marvel at, and photos with Santa. Proceeds support the Boys and Girls Club of the Smoky Mountains, serving over 1,600 Sevier County youth. On December 1, 2017, the night parade is held at 7:30 p.m. in downtown Gatlinburg. The parade features brilliantly lit floats, entertainers, marching bands, a visit from Santa, and more. It starts at traffic light #1A, traveling to Highway 441, and then from light #3 to 10. Beginning November 3, 2017, the Smokies Stadium becomes home to this fantasy of lights. The Shadrack Christmas Wonderland creates not only spectacular displays totaling 11 million lights but also a Santa’s Workshop, operated by the Tennessee Smokies. There are food vendors, pony rides, a petting zoo, and souvenir stations where kids can create their souvenirs. This popular light show runs through January 7, 2018. Kicking off on November 6, 2017, Winterfest brings Sevierville to light with over 15 million dazzling lights over 25 miles. The kickoff event is from 3-9:30 p.m. in downtown Sevierville and features fun activities and entertainment, including a dance-off, face-painting, lumberjack show, a meet-and-greet with Belle and Elsa, inflatables for the kids, and a visit from Santa. Check the website for more information, including details on all the activities planned for the day. The Winterfest lights will be on display through February 28, 2018. On December 2, from 11 a.m. through 1 p.m., there will be a Christmas Parade through downtown Sevierville. This annual parade is in its 55th year and is a wonderful way to get all your family together to celebrate the holidays. On December 10, 2017, get in on this magical experience at The Wilderness Resort. All adult racers receive a Santa hat and beard, a Santa shirt that can be worn during the race, a 5K or half finisher medal, and candy cane socks. Kids who race receive a Santa hat and beard, a race bib, and a finisher ribbon. Early registrations (until November 25) are discounted. Runners and visitors can also bring unwrapped toys, as the Marines will be collecting Toys for Tots for donation on race day. Check out the website for more information. Looking for more things to do in the winter? Check out our blog post covering activities, shows, food, shopping, and more. Everything you need is right here at MobileBrochure.com! Will be there Dec 7-11th. With my family. 2 of my grandbabies have never seen the lights so excited for them to experience it. I just didn’t realize there was soo much to experience. All I’ve ever seen are the lights on the Parkway. Excited!! !